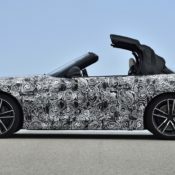 BMW has released the first official footage of the all-new 2019 BMW Z4 as the sports car flexes its muscles on the test track. It’s a heavily camouflaged prototype of the Z4 M40i model we get to see here, but man does it look sprightly with its new in-line 6-cylinder engine. Looks-wise, the 2019 BMW Z4 will be close to the Pebble Beach concept we saw a while back, which is a very good thing. But if you were a fan of the old Z4’s folding hardtop, well, that is gone in the new model. This one boasts a simple, lightweight, old-fashioned soft-top. But hey, as long as it looks cool, who cares. 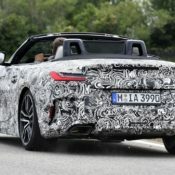 As mentioned the 2019 BMW Z4 prototype in action in this footage is the top-of-the-line Z4 M40i model, and it comes with a whole host of M goodies. The main highlights include a lowered sports suspension with electronically controlled dampers, a newly developed front axle, M light alloy wheels with mixed tyres, an M sports brake system and an electronically controlled lock in the rear axle differential. Needless to say there will be cheaper, four-cylinder models with regular body and underpinnings. But this is the one you are going to want. 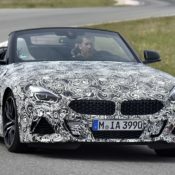 The post New 2019 BMW Z4 Comes Out to Play appeared first on Motorward.